Faculty, researchers and students in the socio‑technical data analytics group at the iSchool at Illinois design, develop, and evaluate new technologies in order to better understand the dynamic interplay between information, people and technology. We are a highly interactive group with complementary areas of interest that span a range of genres from the humanities and everyday life, to journalism, scientific literature and the geopolitical domain. 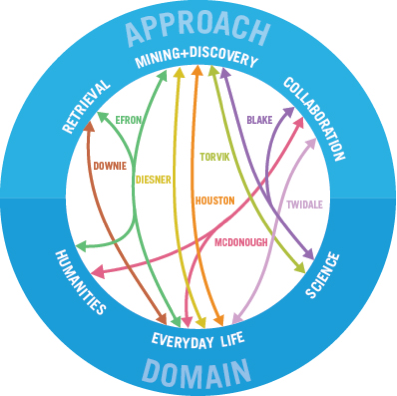 Our research approaches draw on techniques in information retrieval, data and text mining, knowledge discovery, social computing and collaboration, and network analysis. Our domains typically include text, but we also explore multi‑media such as games and music, and social media data such as twitter feeds. The SODA specialization was supported by a grant from The Institute of Museum and Library Services (RE-05-12-0054-12) from July 1, 2012 - June 30, 2016. The work is associated with the Center for Informatics Research in Science and Scholarship (CIRSS), where the first LIS program in Data Curation is also based. The combination of Data Curation and Socio-technical Data Analytics provide a uniquely comprehensive approach to Data Science. See the Data Science Open House Video to learn how CIRSS is involved with Data Science. Funding partners include Google, the National Endowment for the Humanities, the National Science Foundation, the Institute of Museum and Library Services, Andrew W. Mellon Foundation, the Library of Congress, and the Environmental Change Institute.